Each year, 176 invites an artist to create new works and an exhibition that take into account a particular set of givens. These include the former Methodist Chapel in which the gallery is housed, the Zabludowicz Collection of contemporary art, and the specific social and geographic conditions of the surrounding areas of Camden Town, Chalk Farm and Kentish Town. The Gainsborough Packet, the film from which Matt Stokes’s residency exhibition takes its title, draws together the historical and contemporary worlds of folk music in the Northeast of England, where Stokes lives and Camden Town, home to 176. The second work to come out of the residency, Club Ponderosa, might be loosely termed a ‘space for social interaction’. It developed from Stokes’s desire to explore and collaborate with the communities, groups and people who live, work and meet in the neighbourhood of 176. The project takes its name and mission from two precedents. Firstly, from Ponderosa, an ad hoc shelter built on communal ground in a street near Stokes’s home in the West End of Newcastle, andused for gatherings or simply for being outside of one’s home and pondering. Secondly, from the Ponderosa ranch, which was the setting for the 1960s and 1970s American TV series Bonanza. The programme offered an unusual portrayal of life in the Wild West, with the ranch as the site of nurturing family and community relationships, rather than a stage on which major dramas were played out. These sources for the club share a utopian aspect and a strong sense of independence, conducting their activities or fulfilling their desires outside the mainstream and extracting themselves from the confines of so-called ‘normal’ society. At the time of writing, Club Ponderosa exists as a space of potential. The club will be open between February and June 2009, during which time it will host a number of events, performances and meetings. Until then, it exists as a virtual space waiting to be actualised, characterised by unpredictability. Afterwards, the residue that survives its dismantling will exist in the things created during the club’s existence, in the new relationships and collaborations that grow out of its activities and in the flesh, blood and souls of the participants. The impetus of the club, rather than being one of redemptive social action, is an experimental one. The space will exist not just for action but also for interaction; people with different interests, practices and above all passions will react with and against one another to form new compounds and precipitations. The club will also allow those involved—both the participants and the artist—to react against themselves, testing their own flexibility and elasticity, their resistance to change. Escaping well-trodden paths and ingrained behaviours, and taking their selves out of themselves, the participants in Club Ponderosa will make something, rather than just be something. Club Ponderosa reflects a belief that the design of social spaces is a crucial factor in determining the ways they function and that the design process should actively involve the users for whom such spaces are ultimately created. This also means that, as a social space, Club Ponderosa will ultimately be more than the sum of its parts: more than the events, performances, objects and people involved. It will have a supplementary value that exists in direct relation to the use that is made of the space. Club Ponderosa also depends on a lengthy process of developing relationships and cultivating the trust and willingness of its participants, who have been invited to join the project based on a loose set of criteria: that they are self-organised informal groups or individuals, operating independently of any official structures, with a DIY approach to their activities. These are amateurs in the original sense of the term, which comes from the Latin word for ‘lover’: they are people whose initial motivation is their love for what they do, rather than any financial gain that might accrue from their activities. In early stages of the club’s development Stokes met the Kentish Town Living History Group, the New Factory of the Eccentric Actor and a Kurdish architect who spends his summers building villages in Kurdistan and his winters running a health food shop on Chalk Farm Road, among others. The club brings together individuals whose beliefs and activities may be slightly at odds with one another, takes them out of their comfort zones and asks them to envisage ways of working with people from different ages, cultural and class backgrounds and with sometimes radically different world views and passions. Its activities cannot be rehearsed, nor its outcomes guaranteed. More than just a venue, the club’s heterogeneous membership, its flexible attitude and unique architectural and historical situation offer a context for groups to do things in a new way. 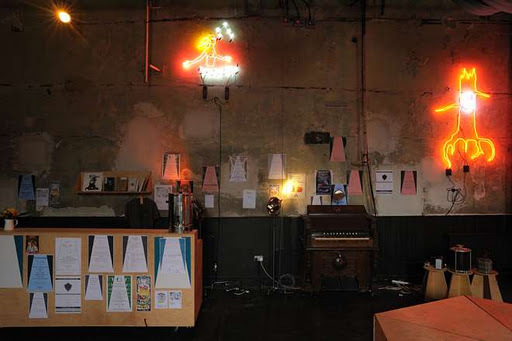 In this sense it mirrors the artistic residency at 176, which encourages artists to respond to the particulars of its structure and origins, its building, collection and its independence from politicised art-funding structures, a freedom which allows an open-ended approach and important risks to be taken. Club Ponderosa is therefore not a performance, planned in advance and rolled out on the allotted day for a passive audience. Instead, it is a performative space with no foregone conclusions. It allows doing and making to take precedence over performing and showing. Club Ponderosa will also be home to MASS, a free collective sound system made up in part of donated equipment. The group of donors includes individuals who build and run sound systems or who agreed to contribute components they held in storage. They have also offered advice on designing and building sound systems, and their participation in the project stands to be part of a wider legacy should the system continue to amass components and be used elsewhere after its stretch in Club Ponderosa. MASS offers a key to Club Ponderosa and indeed to Stokes’s practice in general. The clue is in the name’s dual connotations of worship and community. Stokes’s work reveals a long-term fascination for groups that form and exist outside mainstream culture, especially subcultures motivated by a love of a certain type of music. Works such as Club Ponderosa and MASS mine the rich seams of belief, commitment and passion that characterise these groups, as well as their susceptibility to dogma, by creating contexts in which people can perform their passions and enact their rituals. In such contexts, the answer to the question, Why make such an artwork? lies in the very doing of it, and in the subjectivities that are produced as a result of the encounters it provokes. In such cases, the art ‘work’ becomes a verb rather than a noun. Though formally very distinct from Club Ponderosa, The Gainsborough Packet does bring together different groups and participants, giving life to cultural histories and currencies of English folk music. A particular aspect of the residency that guided the production of the work is the chapel that houses 176, which was built between 1867 and 1871. For nearly a century, it was an active place of worship and the head of the Methodist circuit of five churches in Kentish Town, holding over 1,050 worshippers. It was also famous for its Men’s Meetings, which, according to the Methodist Recorder of 1908, hosted musical performances of “a high standard of excellence”. In the 1960s, the Methodist community moved to newly-built premises and the building was taken over by the London Drama School, a breakaway group from the Central School of Speech and Drama, which pioneered the teaching of Constantin Stanislavski’s technique of method acting, and which occupied the building until 2004, after which plans for 176 were put in place. One of Stokes’s central concerns in approaching the residency at 176 was to investigate the histories of Camden and Newcastle, particularly the crucial moment of industrial expansion the two cities experienced during the early to mid-1800s, and its accompanying cultural developments. During this time, the population of Camden developed into a thriving urban community, an expansion that was catalysed in large part by growing canal and rail networks. Evidence of this growth is still visible today, in the forms of King’s Cross station, built in 1852, and the Roundhouse, which now houses an arts centre but was originally a steam engine repair shed built in 1847, within view of 176. Burdikin’s letter was at the root of The Gainsborough Packet, inspiring lyrics for a song that was recorded and turned into a music video set in northern England during the late 18th and early 19th centuries. The project involved a group of respected musicians including songwriter Jon Boden, whose groups Spiers and Boden and Bellowhead are at the forefront of the contemporary folk music scene; composer Alistair Anderson, one of the UK’s leading exponents of traditional music; and American producer Tim Kerr. As a folk musician, artist and pioneer of punk music in Austin, Texas, Kerr was ideally placed to offer the project a different perspective, linking it with a work Stokes made in parallel with his residency at 176. these are the days (2008) is a two-channel film installation exploring the punk scene that has been a counterpoint to mainstream culture in Austin over the last three decades. The musical team working on The Gainsborough Packet transformed Burdikin’s letter from archival material into a fully-fledged pop-folk song, which was recorded with singer Sam Lee, who also incarnates Burdikin in the video for the song. In a twist that exemplifies the interconnectedness of Stokes’s residency at 176, Lee is the outreach officer at the Camden-based English Folk Dance and Song Society where Stokes conducted initial research for his residency. He is an active figure on the contemporary folk scene, organising regular club nights and teaching on the Traditional Music degree at the SAGE Gateshead music centre. By involving experts in the field of popular and academic folk music, Stokes’s process unravels an entire cultural world, pulling out its historical and contemporary elements like so many threads in order to weave them back together again in the timeless shape of The Gainsborough Packet. Like much of Stokes’s work, The Gainsborough Packet was launched by a combination of factors: finding Burdikin’s letter; a residency in a 19th-century former house of worship; and the important presence of folk music in the Northeast of England and Camden. A plan for the work developed over several months, during which time Stokes attended numerous folk music performances, clubs and group meetings in North London, constructing a picture of the scene, exploring its possibilities and developing relationships with its main protagonists. Acutely aware of the dangers of simply ‘dropping in’ to such sacred spaces as music clubs and being perceived as a ‘tourist’, Stokes’s intention is not to become assimilated into these groups, but rather to remain on the sidelines as an observer. Being a borderline figure in these groups enables him to suspend personal judgement and to be swayed by the opinions of the people he meets. While they incorporate historical sources, facts and archives, Stokes’s works make no claims to documentary transparency or scientific objectivity. They leave intact the integrity of their factual origins while departing from them in unexpected formal and aesthetic ways, and interpellating audiences. As an exhibition, The Gainsborough Packet, &c. asks us to reassess our assumptions and prejudices about particular historical moments and cultural groups, and indeed about our own identities. It compels us to consider and explore the minor histories that have such powerful impacts on our own and other people’s lives. The practices of traditional and contemporary folk music could be seen as defining themselves in opposition to one another. The Gainsborough Packet uses elements from both in order to generate something new. This strategy of productive confrontation also guides Club Ponderosa, which asks various groups to decamp from their usual territories and comfort zones, and to question ingrained tendencies towards self-mythologizing. The test is whether these groups can withstand such a questioning, and where they will go from there. It could be said of Stokes’s works that they make a stand against the natural settling of systems, the well-rehearsed versions of individual and group identity, catalysing relationships and reactions, producing new cultural forms and encouraging new ways of being and acting.